The definition of routine is “a sequence of actions regularly followed.” Sounds innocuous enough, doesn’t it? Routine is comfortable and even comforting. And it can be beneficial to know what’s expected of us, or what’s coming up next in a given situation. But routine can also be a bad thing. Routine can be mindless… monotonous. “In a routine” can easily become “stuck in a rut.” I know there are times when I have felt trapped by the feeling that I absolutely have to do what I’m expected to do. Today’s verse in Isaiah speaks of ritual. “The Lord says: ‘These people come near to me with their mouth, and honor Me with their lips, but their hearts are from Me. Their worship is made up only of rules taught by men. '” Because ritual ~ if there’s no heart behind it ~ is merely repetition. And religion is a danger zone. The songs we sing, the words we pray, even the motions we make with our hands can become meaningless. For me, I know sometimes, even when I’m singing worship songs, my mind is on things other than God. It’s something the Pharisees were famous for. “Woe to you, teachers of the law and Pharisees,” Jesus said, “You hypocrites! You clean the outside of the cup and dish, but inside they are full of greed and self-indulgence.” Ritual for the sake of ritual is cleaning the outside of the cup and the dish, without caring about the condition of the inside. But ritual, when backed by heartfelt devotion, can be a beautiful thing. Have you ever seen a group of soldiers when the National Anthem is played? To them, it is not just a ritual before the first ball is thrown. And I remember a few years ago, my wonderful mom and I went to a symphony performance where a group of Norbertine Fathers from a nearby abbey performed in Gregorian chant. 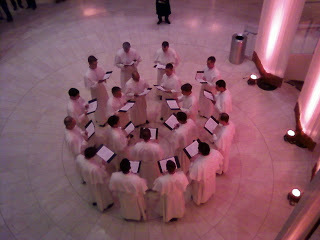 Before going into the concert hall, they sang in the lobby, and people gathered around them. Mom and I went up one level where we could hear better. The view, and the music, were beautiful. At one point, they bowed their heads for several seconds, then lifted them again, all while singing. Mom and I discussed afterwards, what might have been the words they were singing when they bowed their heads. Were they singing about the crucifixion? Or maybe about God’s might and power? Well, at intermission, we happened to see one of them, and he told us that they bow their heads when they invoke the Trinity. Now, of course, I cannot be sure that their hearts were in a place of reverence and devotion, but I think the odds are pretty good. And I think for most of us, there is some aspect of God, or some realization of Him, that makes us appreciate Him more, whether it’s the Trinity, the crucifixion, or simple awe at His power and majesty. And that appreciation should engender a response in us. And whether that response is bowing your head, raising your hands, singing a little louder, or even tearing up a little, it’s a beautiful response if it comes from your heart ~ even if it happens routinely.